The Hermitage Foundation awarded Jeff Koons and Erik Bulatov for their pioneering careers, though Bulatov is still a well-kept secret. With its 250th anniversary only two years away, the State Hermitage Museum in St. Petersburg is determined to celebrate 21st century art by filling its new wing, which faces the Winter Palace, with contemporary art. The world-renowned museum is relying completely on donations for this push, and the nascent collection so far includes Ilya and Emilia Kabakov and Robert Rauschenberg and a handful of other prominent artists. The New York-based Hermitage Museum Foundation recently launched the “Art from America” program in the hopes of bringing more American contemporary artists to the collection. At a gala earlier this month, the foundation honored two beloved and pioneering artists, Jeff Koons and Erik Bulatov for their contributions to contemporary art. While Bulatov and Vassiliev are not as well known as Koons, they are among the most significant living artists from Russia and pioneers of the Soviet Nonconformist art movement. Their large-scale works explore powerful symbols, language, dreamscapes and other visions. The Hermitage Museum is one of the largest and oldest in the world, with about three million items in its collection, of which only a small percentage are on display. But it is not just the lack of space that the museum is grappling with, it is catching up with the rest of the world. That said, the foundation is not pushing for radical changes at the Hermitage—something Russians might not tolerate. “Yes, there are a lot of classics there. But there are impressionists there too. And Catherine the Great was collecting a lot of stuff that passed for contemporary art in her day. So what’s the difference?” said Paul Rodzianko, the foundation’s chairman. He explained that nothing happens in isolation. Artists, even contemporary ones, take inspiration from the great masters, such as the ones housed in the Hermitage. 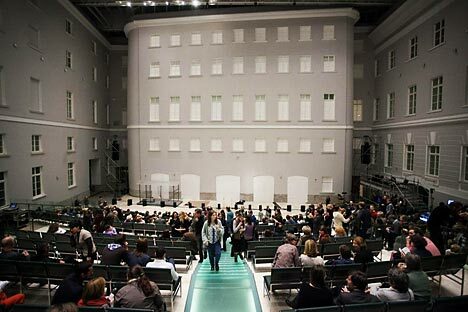 Contemporary art curator for The Hermitage, Dmitry Ozerkov, told Russia Now in an earlier interview that the museum wants “to develop principles for contemporary art. We want a collection, and we understand we can’t have it tomorrow,” he said. Contemporary shows at the Hermitage have been acclaimed by critics, but not always by viewers, he said. The foundation is independent from the museum, but any differences in opinion are resolved, he believes, in their common goal of having a cultural platform understandable and accessible for all. Besides the Vassiliev gifted by Rector, it is yet undecided what works will be given to the Hermitage as part of the Art from America initiative. Without having an unrestrained budget, choosing the works and bringing them to the Hermitage is a mission of diplomacy. “If you write me a check for 100 million tonight and say you want us to buy a Warhol, a Damien Hirst, a Jasper Johns, something like that, we’d be in a position to tell the Hermitage, look, we have a targeted donation, we’d like to offer you these things. And if the works are world quality, they would very likely say, sure,” said Rodzianko. But counting on a donation of such proportions is not realistic, he added. “It’s probably had a fifty year disadvantage compared to American museums, in terms of knowing the collectors, knowing the artists and knowing the institutions that direct the art world,” said Rodzianko. The foundation’s task and aim is to identify people who are interested in the Hermitage having an American presence. Those who donate will have the satisfaction of knowing that their contributions will have great impact. Bulatov said that of course, for the young generation of artists living in Russia, what goes on in the art world in America has a great significance for them. But personally, he hopes that the foundation will focus its resources not only on Art from America, but that it will continue bringing the Hermitage and Russian art to America. The painter laments that Russian art isn’t appreciated on the same level as European or American art.